Peugeot 5008 1.6 E-HDI ALLURE. Fantastic family 7 seater with parking camera, sat nav and Bluetooth at a great price. Peugeot 5008 1.6 E-HDI ALLURE. Diesel/Automatic finished in Black. The 5008 is one of our best selling 7 seats as it has a tonne of space inside and always is well spec'd for the price. This great diesel family car is spacious, practical with 7 seats and a very large boot when the rear 2 seats are down. 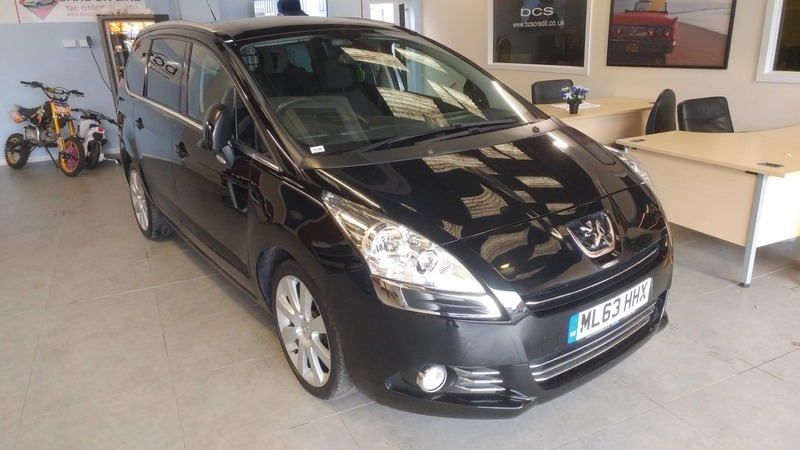 This 5008 is in good condition inside and out, looks absolutely fantastic in Black with privacy glass and 17" alloy wheels, and has been well looked after by its previous keepers. The cabin is spacious and light thanks to the multitude of seating options. It has multi-function steering wheel controls, climate control and parking camera and parking sensors to help keep your hands on the wheel and help you drive in comfort and safety at all times. Being the Allure model it has a fantastic spec that includes Bluetooth, Sat Nav, 18" alloy wheels, electric folding mirrors, MP3, Isofix plus so much more on top. The running costs are comparatively low due to the frugal diesel engine which returns a great 58.9 MP and road tax is £120 a year, however, it does deliver 115 BHP so drives really well. This is a fantastically priced family 7 seat vehicle that includes a 6-month dealer warranty and 12 months AA cover for peace of mind.